Doenier was an undergraduate researcher in the lab of biochemistry professor Judith Kimble for three years. Undergraduates in the Department of Biochemistry can earn a degree from either the College of Agricultural and Life Sciences or the College of Letters and Science. The Kimble Lab studies the fundamental mechanisms of animal development, using the microscopic worm C. elegans as a model organism. His project was working with a postdoctoral scholar, Scott Aoki, on tethering experiments. In the germ line, stem cells are controlled by many proteins that bind to RNA. The pair worked to use a technique that tethers these proteins to specific RNA molecules that allow them to study how the proteins function. Jon Doenier in the Kimble Lab. Photo by Robin Davies. Doenier plans to pursue graduate school to study synthetic biology and protein design. 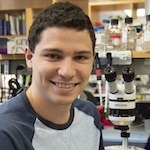 While at UW–Madison he was also part of the Student Society for Stem Cell Research, which helped him connect with more student researchers on campus and do outreach activities about stem cell research.